PATRON, a subsidiary of EXTRAVAGANZA INTERNATIONAL, INC., has announced an aggressive plan to benefit current and new token holders. The plan will consist of a token swap that will be accompanied by a buy-back program and at least five new exchange listings. CEO Atsushi Hisatsumi led the company through a $40 million ICO and several initial exchange listings. The company recently made headlines for partnering with a few leading influencers in the United States, including Saweetie. The company was recently featured in Forbes as the top blockchain startup to watch. The upcoming plan will begin with continuous exchange listings and a buyback program that will see the board of directors burn a portion of their tokens to benefit the greater community. Also, a proposed token swap is also in the works. 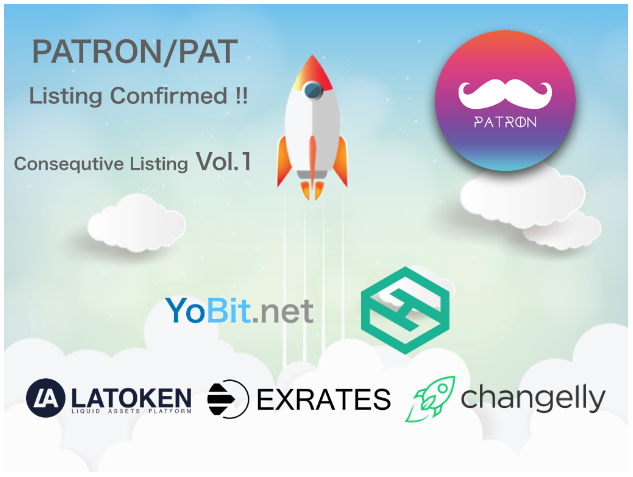 The leadership team of PATRON have slated five exchange listings to help acquire new token holders, increase liquidity, and increase transaction volume. Currently, five exchanges have approved PAT tokens for listing: Hotbit, Extrates, Yobit, Changelly, LATOKEN. The team has also announced its intention of listing on leading South Korean exchange, Kucoin in the upcoming weeks. Details will be announced when confirmed. PAT is also in the running at CoinEx for listing. You can vote for PAT to win the listing competition here. Currently, PATRON (PAT) is targeting to launch a mainnet by late September to October. In order to do this, there is a possibility of a platform change and resulting token swap needed for compatibility. In the case another blockchain platform, besides Ethereum, is used, token holders will be guided on the migration and swap. At the time of the mainnet launch, PATRON will notify current holders of both host wallets and guest wallets. You will need to be a current holder of PAT tokens to participate in the token swap. In addition, the PATRON team is going to perform a “buyback” and “coinburn” of PAT tokens at this time. These are at the request of the PAT community to help with liquidity and appreciation of PAT tokens. PAT tokens will also be burned from the team’s pool. The Patron team will be attending the Crypto Finance Conference in California on September 5. 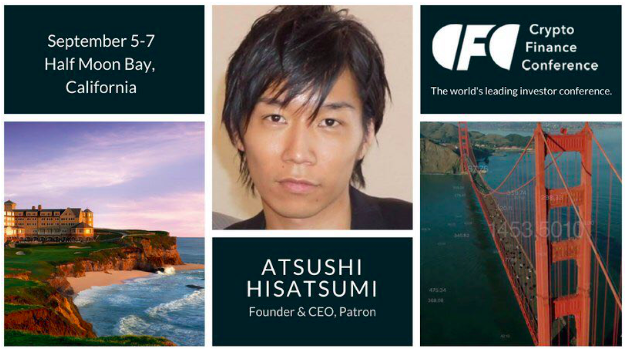 CEO Atsushi Hisatsumi will be a guest speaker. The event will take place at the Ritz-Carlton at Laguna Niguel. Other confirmed speakers and guests include Chris Larsen (Ripple Chairman), Tim Draper (Draper Associates), David Namdar (Galaxy Digital), Bill Tai, Jeffrey Wernick, Catherine Ross, Dane Morehead, and more. Business description: EXTRAVAGANZA INTL (established February, 2017, headquartered in the state of Delaware, USA) has 1. Software development, 2. 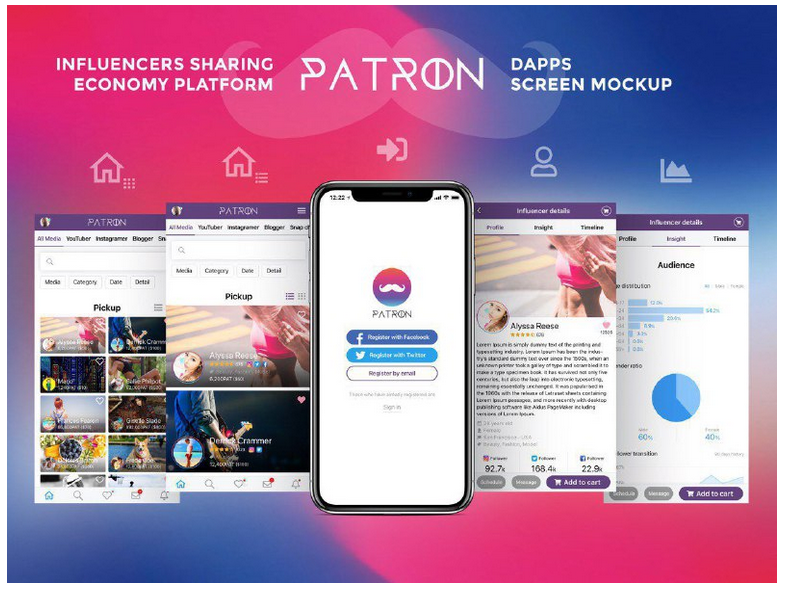 Marketing support as core business, which develops and manages “PATRON” and https://fansta.us/ that is a trustworthy community marketplace where influencers and SNS users can post, release, buy and sell, and live stream their media by the internet, smartphones, and tablets.